One of the biggest Arab television news networks agreed Monday to halt reports from Iraq after the U.S.-appointed government raided its offices, banned its broadcasts and threatened to imprison journalists. Media groups said the action called into question the future of a free press in Iraq. The Iraqi Governing Council accused Al-Arabiya of "inciting murder" for broadcasting an audiotape a week ago of a voice it said belonged to Saddam Hussein. "We have issued a warning to Al-Arabiya and we will sue," said Jalal Talabani, the current council president. "Al-Arabiya incites murder because it's calling for killings through the voice of Saddam Hussein." He said Al-Arabiya would be banned from working in Iraq for "a certain time," which he didn't specify. Shortly after Talabani finished his news conference, about 20 Iraqi police officers raided Al-Arabiya's offices in Baghdad's Mansour neighborhood, making lists of equipment to be seized if it continued to broadcast from Baghdad, said station correspondent Ali al-Khatib, reporting live from the Iraqi capital. Al-Khatib said the officers, who carried an order from the Governing Council, told employees they would be fined $1,000 and imprisoned for a year for each violation. He said officers told correspondents the council might reconsider its decision if the news channel writes a letter pledging never to encourage terrorism. A U.S. military policeman drowned when his vehicle rolled into a canal south of Baghdad, a statement said Monday. He was the 428th American to die in Iraq. U.S. troops opened fire after an explosion near a military convoy Monday in Mosul, as fears grew that the anti-coalition insurgency was spreading north a day after two American soldiers were savagely beaten and killed in the same city. Near the northern city of Kirkuk, an oil pipeline was on fire Monday. Adel al-Qazzaz, manager of the Northern Oil Company, said he believed sabotage was to blame. Insurgents have repeatedly targeted pipelines, and sabotage of oil infrastructure has become a major problem for the U.S.-run coalition. The U.S.-led coalition said it had grounded commercial flights after the military confirmed that a missile struck a DHL cargo plane that landed Saturday at Baghdad International Airport with its wing aflame. An Iraqi Sunni Muslim religious leader Monday called on U.S. forces and resistance groups to observe a one-week cease-fire to allow the Iraqis to celebrate Eid al-Fitr, which marks the end of the holy month of Ramadan, media reports said. In the Mosul attack, gunmen activated a roadside bomb and opened fire on the convoy, injuring a soldier, the military said. Local residents said U.S. troops immediately cordoned the area in Hay al-Dobat neighborhood. "I heard a strong explosion saw the Americans randomly shooting in all directions," said Omar Hamed, a witness. On Sunday, gunmen in Mosul shot two American soldiers driving through the city center, sending their vehicle crashing into a wall. About a dozen swarming teenagers dragged the men out of the wreckage and beat them with concrete blocks, the witnesses said. The frenzy recalled the October 1993 scene in Somalia, when locals dragged the bodies of U.S. Marines killed in fighting with warlords through the streets. The savagery of the attack was unusual for Mosul, once touted as a success story in sharp contrast to the anti-American violence seen in Sunni Muslim areas just north and west of Baghdad. In recent weeks, attacks against U.S. troops and their Iraqi allies — such as policemen and politicians working for the interim Iraqi administration — have increased in the region surrounding Mosul. In Kirkuk, 150 miles north of Baghdad, three American civilian contractors from the U.S. firm Kellogg Brown & Root were injured Sunday when a bomb exploded at an oil compound. In Baqouba, just north of Baghdad, insurgents detonated a roadside bomb as a 4th Infantry Division convoy passed, killing one soldier and wounding two others, the military said Sunday. And gunmen killed the Iraqi police chief of Latifiyah, 20 miles south of Baghdad, and his bodyguard and driver, American and Iraqi officials said. That was at least the third Iraqi official murdered in the past week. 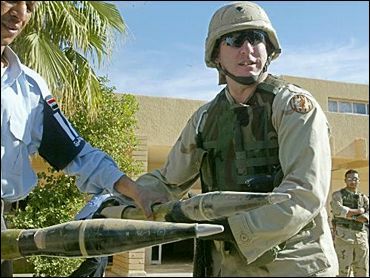 Bush administration officials have hailed the new freedoms enjoyed by Iraqis since the overthrow of the Saddam regime. But human rights groups are growing more concerned about the relationship between the U.S. occupation and the media. Al-Arabiya has clashed with authorities before for its coverage of Iraq. In July, U.S. Deputy Secretary of Defense Paul Wolfowitz said Al-Arabiya and another Arab news channel, Al-Jazeera, incited violence against American forces with slanted reports. In September, the Governing Council temporarily banned Al-Arabiya and Al-Jazeera from entering government buildings and news conferences, accusing them of being aware of attacks on American troops before they occurred. And last week, U.S. Defense Secretary Donald H. Rumsfeld called the two stations "violently anti-coalition" as he announced the planned launch of a U.S.-run satellite channel to compete with the wildly popular news stations. Outraged Al-Arabiya correspondents accused the government of trying to stifle a free media. "Opposing opinions should be respected," said correspondent Hadeer al-Rubei. "What was practiced during Saddam's rule is being practiced now." Al-Arabiya correspondent Jawad Hattab said that in broadcasting the Saddam tape, the station was merely carrying out "its fundamental journalistic duty, which is to broadcast excellent news that people expect." New York-based Committee to Protect Journalists condemned the government action. "This is the latest in a string of heavy-handed actions by the Iraqi Governing Council and U.S. and coalition authorities toward the media that make us apprehensive about the future of press freedoms in Iraq," said the group's Middle East program coordinator, Joel Campagna. In the past, U.S. forces have detained journalists and shut at least one newspaper. The Paris-based media watchdog group Reporters Without Borders called the closure a violation of freedom of the press and said it represented "methods … that are contrary to the promises of setting up a democracy in Iraq."